Better Together Series: Savor the flavors of fall with this fresh, Mediterranean take on roasted, stuffed tomatoes. Preheat oven to 375° F. Bring a large pot of water to a boil. Cut the top off each tomato, carve out the inside leaving only the outer part, creating a vessel for pasta, set aside. In a skillet, sauté anchovy (optional), capers and olives with half the olive oil for about one minute, add sauce and bring to a boil. 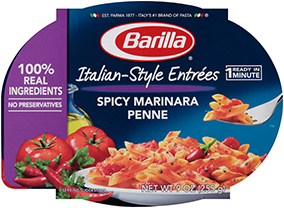 Cook pasta 1 minute less than package directions and drain. Toss with marinara sauce mixture and basil, let cool down. Stir in mozzarella and fill tomatoes with pasta mixture. Mix Panko with remaining olive oil then top each tomato. Bake stuffed tomatoes until Panko is golden crispy and mozzarella is melted, about 10 minutes.